Health and Family Welfare Minister Zahid Maleque on Sunday urged health officials for working sincerely to build patient-friendly management at hospitals. 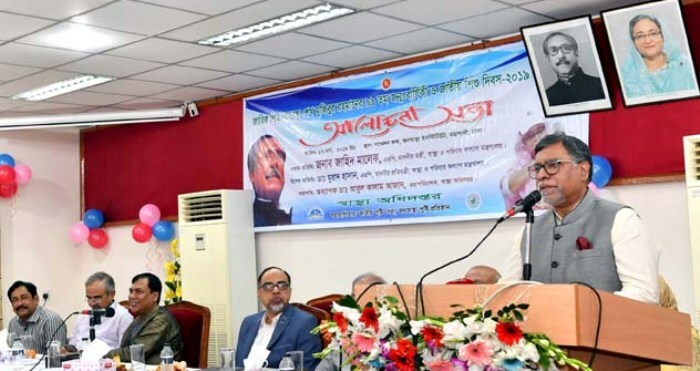 He also urged the doctors to serve the patients being inspired with the ideology and philosophy of Father of the Nation Bangabandhu Sheikh Mujibur Rahman. He was addressing a discussion meeting as the chief guest on the occasion of the 100th birthday of Bangabandhu and National Children’s Day -2019 at the auditorium of the National Public Health Institute in city’s Mohakhali area. Directorate General of Health Services (DGHS) organized the meeting with its Director General Prof Abul Kalam Azad in the chair. He said that after independence of Bangladesh Bangabandhu took initiatives to ensure health services available for the poor and distressed people of the country. Health Secretary Asadul Islam, President of Bangladesh Medical Association (BMA) Dr Mostafa Jalal Mohiuddin, President of Swadhinata Chikitsak Parishad (SWACHIP) Professor Dr Iqbal Arslan and BMA former Secretary-General Professor Dr Sharfuddin Ahmed also spoke on the occasion.